Blue-Eyed Eddie Diamond's dreams of being in the big league were shattered at a very young age. As a pitcher, his slider suffered when his arm began strumming guitars instead of listening to his baseball coach's advice. Somehow disappointments became fertile ground for combining his musical sensibility with his love of the game. 'He's a natural...a natural what, I don't know,' observes Hank Dakota, one-time sports commentator for the Metropolis Mockingbirds. Born in Memphis, Tennessee, Diamond's music has little kinship to the deep tradition of the region. 'I think that works to my advantage,' Diamond points-out. 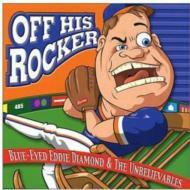 'I'm an enigma to both baseball and the blues...songs just have to be funny sometime.' Diamond kicks off his national tour in Chicago and New York, where baseball fans are pumped-up about welcoming John Rocker to their hometown. Rumor has it that a confrontation between Diamond and Rocker could make for quite an entertaining seventh-inning stretch. Back in his old Mockingbird uniform, 'Blue-Eyed' Eddie Diamond is prepared for the challenge either on the pitcher's mound or at a local dive near you.